Effective December 31st, 2017 The United States Department of Defense (DoD) Federal Acquisition Regulations Supplement (DFARS) requires that any contractor doing business with the Department of Defense must be compliant with NIST SP 800-171. In addition to the DoD, many other local, state, and federal government agencies are adopting and mandating compliance with the NIST SP 800-171 standard for managing information security. Penalties for not being compliant include losing your contract and ability to do business in the future. The time to get compliant is right now. Yes! I Want to Talk With a NIST SP 800-171 Compliance Expert Right Now About My Specific Compliance Concerns. Fill Out The Form Below To Receive A Call Back. Your Information Is Safe With Us. On Call will never sell, rent, share or distribute your personal details with anyone. In addition, we will never spam you. 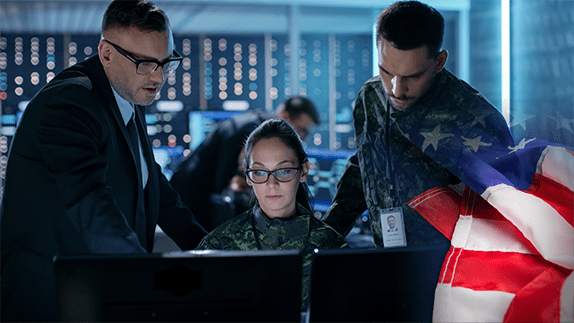 NIST SP 800-171 Is About To Change The Way You Approach Cyber Security, Personnel Training, and How You Handle Information No Matter How Large Or Small You Are. If you're not compliant, you're technically no longer qualified to contract with the DoD - no matter which contracts you have in place or the professional relationships you've built over the years. On Call Computer Solutions, LLC. and rest easy knowing that your data and information security standards and practices meet or exceed what is required of you. Fill out the quick form above to schedule your NIST SP 800-171 Assessment with our team of knowledgeable and experienced experts. On Call has experience successfully completing NIST SP 800-171 Assessments, IT Security Audits, and delivering Cyber Security best practices consulting in both private and public sector environments of all sizes. Our streamlined assessment process can guide you through becoming compliant in as little as one day - all you have to do is reach out to our team. find out where your Compliance Gaps are because you are a small or medium sized office and think compliance may be too expensive for you? Don't risk losing your government contract over not being NIST SP 800-171 compliant. We can help. Give us a call now to learn about our NIST SP 800-171 on-site GAP Analysis. Have one of our compliance experts travel to your office to complete a single day NIST SP 800-171 compliance analysis to find out where your compliance gaps are AND get expert consultation on exactly how to resolve any compliance issues we find. Our compliance experts can travel to your office(s) with typical availability within two business weeks. Get a real analysis of what it takes to become compliant with a complete facility review, IT Systems review, and personnel policy review. Get real answers based on YOUR office needs to become compliant faster. NIST SP 800-171 compliance is not something that can be achieved with a boxed solution. Each organization has unique Facility, IT, and Personnel needs which must be addressed. By conducting an on-site review we are able to see exactly what any auditor would see if they came on-site to conduct an audit. This allows us to help you fully close the gap on compliance and rest easy knowing that before we make any suggestions to help you become compliant, we get to know you and your unique needs first. Save big money by mitigating risk associated with NIST SP 800-171 regulated information and procedures. One of the biggest reasons so many DoD contractors choose to pick up the phone and call us is because we will save you money on becoming compliant. Not everything in your organization must meet the NIST SP 800-171 standard! Our compliance experts can help explain where to invest in meeting compliance standards and where you can save money by separating NIST SP 800-171 covered information. Not all information in every company doing business with the Department of Defense must meet this standard. We can show you what must meet compliance and what does not in order to reduce long-term costs while meeting your obligations as a Department of Defense prime contractor or sub-contractor. One easy done-for-you consulting package to get you the answers you need quickly, the tools to become compliant, and a company who will be there to help with questions and implementation as needed. Continuing compliance assistance as needed to help you stay compliant and be there for you if a compliance issue or breach-- occurs. Backed by an award-winning 98.4% client satisfaction rate On Call Computer Solutions is the #1 source for NIST SP 800-171 Compliance consulting. Give us a call now to schedule a free phone call with a NIST SP 800-171 compliance expert to see how we can help.